This new contribution to the OpenNebula Ecosystem expands OpenNebula by enabling the use of the well-known hypervisor VirtualBox to create and manage virtual machines. OneVBox supports the upcoming OpenNebula 3.0 (currently in beta) and VirtualBox 4.0. It is composed of several scripts, mostly written in Ruby, which interpret the XML virtual machine descriptions provided by OpenNebula and perform necessary actions in the VirtualBox node. OneVBox can deploy but also save, restore and migrate VirtualBox VMs from one physical node to a different one. Make sure that you have permissions to write in the OpenNebula folders. $ONE_LOCATION can be used to define the self-contained install path, otherwise it will be installed in system-wide mode. For more information, you can visit the OpenNebula Ecosystem page for OneVBox. If you have questions or problems, please let us know on the Ecosystem mailing list or open an issue in the OneVBox github tracker. OpenNebula 3.0 is bringing many new features to build cutting-edge cloud infrastructures. Most of them have been developed to address the needs of organizations running production environments. This article tries to summarize the main requirements on security, control and availability that we have received from organizations building infrastructures for mission-critical applications or for offering premium cloud services, and the functionality that makes OpenNebula unique to fulfill these requirements. Because our experience is that there is not a single solution for Cloud availability, our position is that the IaaS cloud stack should provide administrators and integrators with configurable failover and redundancy mechanisms at physical host, zone, region and cloud levels to support availability of running applications services and to support the availability of the cloud service itself. So they can define and implement their specific model for availability in the cloud to fulfill the requirements of their target users and market, from a pure “design for failure” approach (commodity cloud), where software and higher level management tools take responsibility for application availability, to a more “traditional” approach (enterprise cloud), where the cloud provides the availability and redundancy necessary to keep it running in case of failure. In the enterprise cloud case, the design and deployment of the infrastructure is much more difficult due to the high number of components and failure scenarios that can arise, and its integration with mission-critical data center platforms and facilities. Highly Secure Cloud Access: User login and interaction with the cloud is secured using state-of-the-art keys or certificates technology that includes authentication methods such as ssh rsa keypairs, X509 certificates or LDAP. Granular Authorization: OpenNebula provides fine-grained access control that allows multiple-role support for different types of users and administrators, delegated control to authorized users, secure isolated multi-tenant environments, and easy resource sharing. Advanced Multi-tenancy of the Cloud: Cloud zones can be compartmentalized into isolated Virtual Data Centers to ensure that several organizations can access the cloud with an isolated view of their resources. Full Isolation of Service Execution: The functionality for automatic placement of VMs and the configurable monitoring system enable the ability to define security and isolation levels for the applications. The new multiple-zone support extends this functionality to easily manage fully isolated zones that can be located at different data center sites under different security policies and practices. Ensure Application Availability: Configurable behavior in the event of host or VM failure to provide an easy to use and cost-effective failover solution. Replication of Applications Across Sites: The support for hybrid and multi-zone cloud deployments enables the execution of application services in different sites, so enabling the configuration of “design for failure” applications to continue its execution and recover even if a complete site fails. Ensure Cloud Availability: Support for high availability architectures with persistent database back-end with high availability configurations to preserve state of the cloud in the event of a hardware or software failure. Limitation of Resource Consumption: Resource quota management to allocate, track and limit resource utilization. Audit Trails: Detailed log files for the different components that maintain a record of significant changes. OpenNebula 3.0 is free, fully open-source technology. You have the Release Candidate available for download (the stable version is due in few days), the guides and our support to deploy your cloud infrastructure for mission-critical applications. We are really excited to announce that we are working with Microsoft on cloud computing innovation utilizing the Windows Server Hyper-V hypervisor. Microsoft is providing support and technical guidance to OpenNebula open-source project to add and maintain Hyper-V on the list of officially supported hypervisors. Hyper-V adoption is rising fast and its support to build OpenNebula clouds is highly demanded by our community. The results of this collaboration will be incorporated into the OpenNebula distribution and so available freely to the public. We started the work in July and are planning to have a first prototype of the integration in mid October. The new components will be released under the Apache license as a new OpenNebula ecosystem project. In order to provide the greater flexibility, the integration will support both variants of Hyper-V, namely in Windows Server 2008 and Windows Server 2008 R2 SP1. Disk images will be managed using a shared storage server (e.g. SAN) and standard POSIX calls from the OpenNebula server. OpenNebula will additionally leverage the networking management functionality provided by Hyper-V. The integration will not require the installation of new services in the nodes, making quite simple and rapid to build an OpenNebula cloud on existing Hyper-V deployments. This collaboration consolidates OpenNebula’s position as a fully open-source interoperable and innovative solution for the management of virtualized data centers to enable private, public and hybrid clouds. OpenNebula interoperability makes cloud an evolution by offering common cloud standards and interfaces, leveraging existing IT infrastructure, protecting existing investments, and avoiding vendor lock-in. OpenNebula is used by many research projects as a powerful tool for innovation and interoperability, and by thousands of organizations to build large-scale production clouds using KVM, Xen and VMware. Microsoft’s Windows Server with Hyper-V platform is growing in the enterprise space and this collaboration with Microsoft will extend the list of supported hypervisors to include Hyper-V to give customers a great choice of enterprise ready virtualization platforms. This is excellent news for the community!. You can visit the Openness@Microsoft blog for additional information. Stay tuned, the first release will be available in few weeks. The OpenNebula team is happy to announce an OpenNebula 3.0 appliance available in SUSE Studio. The appliance has OpenNebula 3.0 RC preinstalled, and both OpenNebula and Sunstone will be up and running once you start the appliance, along with the Sunstone web user interface. It’s available on all SUSE Studio formats, including Amazon EC2. Feel free to download it, or testdrive it to see OpenNebula 3.0 in action! 23rd September 2011. The OpenNebula project announces the availability of OpenNebula 3.0 RC1(2.9.90), the first release candidate of OpenNebula 3 toolkit. This release is consider feature complete and will be further stabilized with fixes for important and critical bugs, the team continues in its bug fixing mode. As noted early, this release cycle is being a bit larger than previous ones, the source tree is almost in release shape. There are some gaps in the documentation that will be filled by the final release. You should expect a final release at the end of the month. Please note that OpenNebula 3.0 RC is not suitable for production environments. We recommend those currently running 3.0 Beta1 or 3.0 Beta2 to upgrade. The OpenNebula team wants also to thank all the feedback received for the previous beta releases. Keep testing! OpenNebula 3.0 comes with a lot of new features: ACLs , Zones, Virtual Data Centers, new network models among others. Please take a look to OpenNebula 3.0 release notes for more information. New authentication methods for Sunstone. Sunstone can be used now with x509 certificates. New authentication methods EC2 and OCCI. The EC2 and OCCI interfaces can be used with x509 certificates now. Access Control for VM deployment. Users can not bypass the scheduler by default (i.e. onevm deploy is not available to all users), it can be configured through an ACL, though. OpenNebula Zones and Virtual Data Centers. A couple of new feautes have been added to easily manage the physical hosts assigned to a VDC. Now you can add/delete hosts, and force sharing of physical hosts among VDCs.This functionality is available through the CLI, but it will be exposed in the Ozones GUI for 3.0 Final. As for OpenNebula 3.0 the internal database uses versioning. Upgrading from OpenNebula 3.0 Beta1 needs to follow the standard upgrade procedure described in the documentation. Database, The DB schema has re-design from scratch, to ease the transition you should use the ”onedb” tool to automatically upgrade your system. C12G Labs has just released a new guide on integrating SUSE Studio with OpenNebula. This guide addresses how to create or adapt any SUSE Studio appliance by simply adding a 20-line script to the appliance, which will integrate the appliance’s network with OpenNebula and will handle the contextualization process. 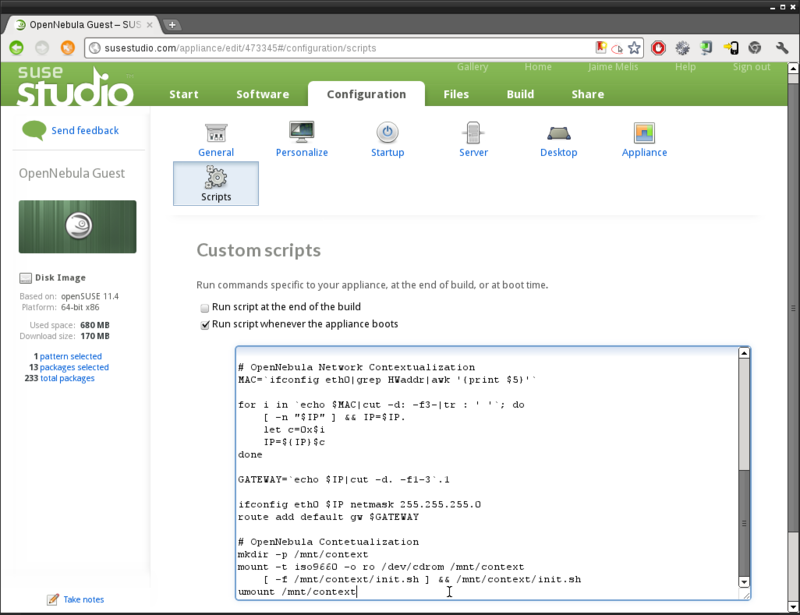 It also illustrates further integration steps to handle SUSE Studio url’s directly by OpenNebula. With a few-lines modification to the driver, it can manage the whole download, unpack and register process. An additional work all OpenNebula users must face is the process of designing new images. This process usually involves downloading installation media, creating a temporary Virtual Machine for the installation process (usually handled by Opennebula) and performing the actual operating system installation, which includes partitioning the virtual disks, installing the required packages and preparing the virtual machine for OpenNebula. With SUSE Studio’s wonderful and intuitive interface the whole process can be done with a few clicks reducing the time spent in preparing images to a minimum. Combining SUSE Studio’s powerful API and OpenNebula’s state-of-the-art integration capabilites there’s room for much more improvement in OpenNebula integration with SUSE Studio. An example of this would be adding a new tab in Sunstone’s Image creation form, specific for SUSE Studio, where a user would see a list of SUSE Studio appliances and by simply selecting it, OpenNebula would clone the SUSE Studio appliance, adapt it and register it, making the appliance available for all the OpenNebula users. Additionally, there are some benefits for Amazon EC2 hybrid users. SUSE Studio can upload the appliances to EC2, so you can easily manage the appliances life-cycle from a single point. So, checkout the Using SUSE Studio with OpenNebula guide, and start using SUSE Studio appliances with OpenNebula! OpenNebula has emerged as a viable open source alternative to commercial cloud management solutions. A number of companies are adopting OpenNebula in their IT infrastructure. Not only that, it is also been actively promoted by the European Commission as the basis for numerous cloud computing related research. There is a real need for interaction and exchange of ideas between such projects and the industry partners alike. The OpenNebula Interoperability Working Group has been established to facilitate such an exchange. A lot of effort is being spent by various working groups in coming up with standards for cloud platform management. Open Cloud Computing Interface (OCCI), Cloud Data Management Interface (CDMI), and Open Virtualization Format (OVF) are among the major open standards being developed for standardizing cloud management interfaces and cloud applications packaging. A lot of upcoming European projects that plan on using OpenNebula also have plans to support some of these open standards. A major thrust area of this working group will be to ensure maximum interoperability in the interfaces being developed by such projects. The first interoperability working group teleconference took place on September 07 2011. Attending organizations included INRIA, OW2, UCM, XLab, and TU Dortmund. Other prominent research groups will be invited very soon to join in this interoperability effort. Hopefully, as a result of this working group’s effort, extensibility and re-usability of OpenNebula ecosystem products will be vastly improved. Recently, we decided to make this group’s mailing list open to public. OpenNebula ecosystem members and users are invited to participate and follow the activities of this working group. The Interoperability mailing list will remain the primary mode of information dissemination. Periodic posts along with interesting how-to, API documentations, project showcases will be made available on the working group’s Wiki page. C12G Labs has just announced a new highly competitive pricing plan for OpenNebulaPro Support Subscriptions. Support subscriptions are now offered per managed server, per zone or per data center site at a lower cost with progressive discounts for larger infrastructures and multiple zones. C12G additionally applies pricing discounts for multi-year terms and for Education, Government and Non-Profit institutions. New subscriptions also include lower maximum response times for the three levels of service. The price changes are immediate for new customers, and for existing customers the new pricing will start on their next renewal. In the meantime they will receive an upgrade in their level of service. C12G’s support subscriptions provide long-term multi-year support, production-level support with professional SLAs, integration support for optimal and scalable execution in any hardware and software combination, certification support to validate compatibility with complementary components and customizations, regular updates and upgrades, product influence, privacy and security guarantee, and additional tools for the administration of OpenNebulaPro cloud instances in production environments, all at a competitive cost without high upfront fees. OpenNebulaPro provides the rapid innovation of open-source, with the stability and long-term production support of commercial software. Compared to OpenNebula, the expert production and integration support of OpenNebulaPro and its higher stability increase IT productivity, speed time to deployment, and reduce business and technical risks. Compared to other commercial alternatives, OpenNebulaPro is an adaptable and interoperable cloud management solution that delivers enterprise-class functionality, stability and scalability at significantly lower costs. 8th September 2011. The OpenNebula project announces the availability of OpenNebula 3.0Beta2 (2.9.85), the second preview of the upcoming OpenNebula 3 toolkit. OpenNebula 3 introduces many new components and features for cloud management. With this release, the code base of OpenNebula 3 is feature freeze and the team will concentrate its efforts on polishing and bug fixing. The release cycle of OpenNebula 3.0 is being a bit larger than previous ones as expected. However the source tree is stabilizing fast, you should expect a final release at the end of the month. Please note that OpenNebula 3.0 Beta 2 is not suitable for production environments. We recommend those currently running 3.0 Beta, released last July, to upgrade. The OpenNebula team wants also to thank all the feedback received for the previous beta release. Keep testing! New authentication methods. Those deployments that require a robust and secure authentication system can use x509 certificates and SSH keys. Quota support. The quota service has been moved to the new ACL system and extended to include storage space. Sunstone. The OpenNebula management console has been extended to level its functionality with that of the CLI. https://opennebula.org/wp-content/uploads/2018/11/opennebula_cloud_logo_white_bg-4.png 0 0 Ruben S. Montero https://opennebula.org/wp-content/uploads/2018/11/opennebula_cloud_logo_white_bg-4.png Ruben S. Montero2011-09-08 18:01:492011-09-08 19:45:05OpenNebula 3.0 Beta2 Released! As the summer draws to an end, the OpenNebula team is gearing up for its next major release. Here’s our monthly newsletter with the main news from August, and what you can expect in the coming month. The OpenNebula team has been hard at work on OpenNebula 3.0. We expect a Release Candidate to be available in mid-September, followed by the final release towards the end of the month. One of the main new features in OpenNebula 3.0 will be OpenNebula Zones. In case you missed it, check out our blog post Federating Multiple Cloud Instances with OpenNebula Zones (a follow up to Virtual Data Centers with OpenNebula zones), which describes how OpenNebula Zones can be used to federate multiple OpenNebula sites, even geographically distributed ones. 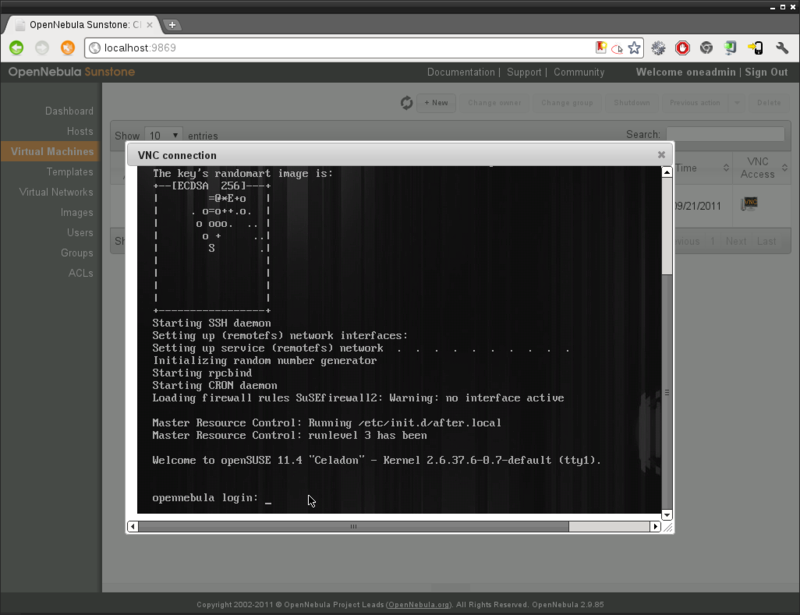 C12G also contributed a howto explaining how to set up OpenNebula for High Availability using a MySQL Cluster. You can find subscription instructions at the mailing list’s page. Users. Use this mailing list when you need technical support regarding OpenNebula. If you want to ask about the project itself, planned features, its current direction, etc., you may want to use the “discuss” mailing list instead. And don’t forget that bugs and feature requests should be reported through our development portal. Announce. This is a low-traffic mailing list for announcements only. Ecosystem. This mailing list is for discussion and technical support of ecosystem components only. Cloud Plugfest #3 will take place September 18-22, 2011 simultaneously in Düsseldorf and Santa Clara, CA. Florian Feldhaus’s team will attend at the Düsseldorf location and will implement, test and demonstrate their OCCI server in combination with OpenNebula 3.0. There will also be a very early implementation of CDMI for OpenNebula. The next OpenNebula IRC sessions will take place on Tuesday, 13 September 2011, 15:00 UTC. In these sessions, the OpenNebula developers will be available for questions in the #opennebula IRC channel on irc.freenode.net. The developers will answer questions about the new features or development and configuration issues that cannot be found in the mailing list archive. If you’d like to meet with us at any of these events, please don’t hesitate to contact us. This last month, Ignacio M Llorente (OpenNebula project lead) gave a keynote on August 31st about OpenNebula and Challenges in Federated and Hybrid Clouds at ParCo 2011.